Nitrogen is an essential nutrient for all living organisms in forested ecosystems. Ammonium, ammonia, and organic nitrogen are forms of nitrogen that typically exist in forest organisms; however, nitrate is often preferred by plants. The nitrogen supply in forests is often sufficient but can sometimes be limited in its abundance. Within the past 150-200 years, however, increased human inputs of nitrogen to the environment have resulted in an oversupply of nitrogen in some forested areas, resulting in damage to living and spawning areas for stream-dwelling organisms, decreased forest health, and violations of federal drinking water standards. Excess reactive nitrogen in the environment arises largely from vehicle emissions, fossil fuel burning power plants, food production and sewage, and nitrogen fertilizers. Inputs of increased reactive nitrogen to forested ecosystems occur primarily in the form of wet (via rainfall) and dry (gaseous and particulate) atmospheric deposition. We now know that within the northeastern United States (the Northeast) approximately 75% of these human-derived inputs of reactive nitrogen to forested ecosystems are stored in soils, groundwater, surface water or vegetation, or are lost from the forested landscape to the atmosphere. This suggests that undisturbed and properly managed forested ecosystems have considerable capacity to retain and efficiently cycle reactive nitrogen and prevent it from entering waterways. If, however, a forested system experiences a disturbance  such as widespread removal of vegetation  its ability to retain nitrogen is diminished. Implementation of sound forest management practices can minimize these effects. What do we know About Tree Removal and Nitrogen Cycling? Research in small watersheds at Hubbard Brook Experimental Forest in the White Mountains of New Hampshire provides some of the first and most widely known information in the Northeast on the effects of forest harvesting on soil solution and stream water nitrogen concentrations. Most historical studies have focused on the effects of clearcuts on stream water chemistry. However, more recent studies have investigated the effects of different types of harvesting systems (e.g., stem only versus partial harvests) on soil and stream water chemistry. As a result of these studies, we know that forest harvesting typically increases the amount and intensity of incoming solar radiation reaching the surface of soils, decreases transpiration rates (water lost from vegetation) and interception (the capture and gradual release of precipitation) by the forest canopy, and increases amounts of precipitation reaching and infiltrating the forest floor. The intensity of these changes, however, is largely regulated by the type of harvesting being conducted and the management system that is applied. For example, clear cuts remove all mature trees from a forest stand, allowing copious amounts of sunlight to reach the soil and dramatically decreasing interception and transpiration rates. A thinning operation, on the other hand, involves selectively removing a percentage of stems (usually 30-40%) and leaving residual crop trees, minimizing changes in these processes. Most forest removal methods produce at least minimal temperature increases on the forest floor and elevated available soil water due to increased soil infiltration and decreased interception and transpiration rates. The increase in soil temperature boosts the activity of soil microbes, which elevates the production of ammonium and nitrate. Consequently, it is possible that concentrations of these two biologically available forms of nitrogen become greater than that which can be used by the few remaining trees. Simply stated, during periods of intense rainfall, recently harvested soils experience rapid soil infiltration and consequent soil saturation. The combination of increased soil water and oversupply of nitrate creates favorable conditions for nitrate runoff to streams. 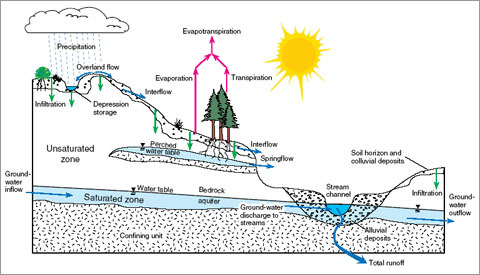 As a result, the nitrate stored in shallow soil water may be transported from the soil to streams via overland flow or by flow through pathways in the soil. Because most undisturbed forested ecosystems maintain tight nutrient cycling, applying a sustainable silvicultural system - a system for regenerating, tending, and harvesting forests - is critical. Essential procedures for maintaining sustainable forest ecosystems and preventing large nitrogen losses to stream water include ensuring advance regeneration (the presence of tree stems before harvest) and young age classes of trees, and maintaining soil quality and stability during and after the harvest with best management practices. A minimum intensity harvesting system that maintains stream buffers and allows for efficient, rapid vegetative regrowth will regulate the effects associated with nitrogen delivery to streams. Many silviculture practices promote such methods, focusing on ecosystem approaches that reduce the footprint of the forest harvest. Bormann, FH and Likens, GE. Pattern and Process in a Forested Ecosystem. 1994. New York, Springer-Verlag. Boyer, EW, et al. 2002. Anthropogenic sources and relationships to riverine nitrogen export in the Northeastern USA. Biogeochemistry 57/58: 137-169. Driscoll, CT, et al. 2003. Nitrogen Pollution: From the Sources to the Sea. Hubbard Brook Research Foundation. Science LinksTM Publication. Volume 1, No. 2. Likens, GE and Bormann, FH. 1995. Biogeochemistry of a Forested Ecosystem. New York: Springer-Verlag. Text prepared by Heather Golden, PhD Candidate, Department of Forest and Natural Resources Management, SUNY-ESF.